Brewing Up Something - Word on the street with Visit Minot!Word on the street with Visit Minot! 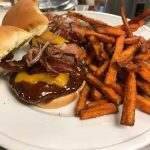 Souris River Brewing is a restaurant and a brewery all in one and a one of a kind in Minot. Aaron Thompson was working as a bartender in Minot before the 2011 flood and people would frequently ask him where the brewpub was. 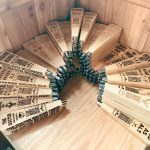 Knowing that Minot did not have a brewery, Aaron decided to make it happen. After the flood, he put together a business plan, found some investors, and bought a building downtown. The building had eight feet of water on the main floor, and the basement of the building was filled with water. Aaron worked hard with the investors to clean out the flooded building and start with a blank slate. 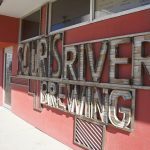 After six months of construction, Souris River Brewing was open for business. Their goal as a microbrewery and full-service restaurant was to focus on premium, craft brewed beers, and natural food, made-from-scratch with all local North Dakota ingredients. They decided to purchase everything locally because they believe in strengthening our community’s economy and fostering good between the great people in our region. They are proud to be a local business and they are proud to support local businesses in Minot. 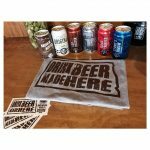 Souris River Brewing is the only microbrewery in Minot, and as a microbrewery, they produce an incredible 47 of their own beers and distribute them in towns all over North Dakota. They have the operation down to a science and are planning to expand their brewery in the future. Craft beer’s popularity is on the rise. Some of their unique craft beers include; Autumn Amber, O’Bryan’s Stout, and Bakken Brown Ale. As for their food menu, they have a wide variety of entrees and appetizers. All their sandwiches, burgers, and steaks come from meat bought from local farmers. Some of the town favorites are the Bison Burgers and their fourteen sliders. They also have unique items such as pierogies, poutine, and elk chili. You can view their full menu here. If the great beer and great food aren’t enough for you, the atmosphere, the live music, and the friendly faces will make you want to sit down and stay a couple hours.